Today, the Singapore Land Authority (SLA) launched a mobile version of OneMap, an integrated map system, launched on the desktop seven years ago in 2010. New features in this app include Map Styles, Driving and Journey Planner and BusRouteExplorer among others. 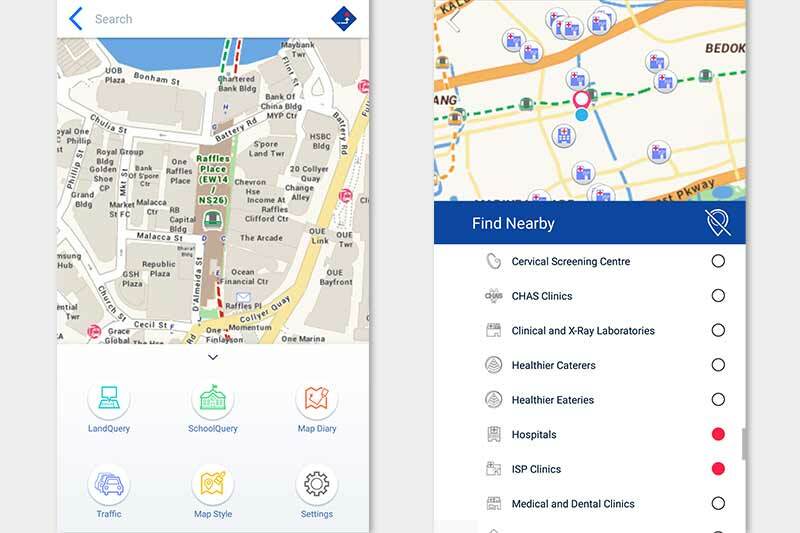 Though commercial map applications are available, OneMap provides an extraordinarily high level of detail unavailable on any other platform, tailored to meet the local requirements of residents or visitors in singapore. It has been described by SLA as the ‘most detailed, authoritative and timely updated map of Singapore’. OneMap is available to download for free in both the Apple App Store and Google Play Store. For instance, Channel News Asia reported that users can find the the most sheltered or shortest walking routes, through the void decks (open space typically found on the ground floor of apartment blocks in Singapore for community use) of HDB blocks (public housing estates in Singapore), and locate the entrance and exit points of car parks and buildings for drivers. Using the app, you can find schools or healthy eateries or identify land ownership and land lot information. You could locate the nearest centre for e-waste recycling or track locations of dengue cases. OneMap is an integrated map system for government agencies to deliver location-based services and information, such as community services (child care, community clubs, eldercare, disability services etc. ), education, environment, safety and security, government institutions (fire stations, libraries, police force establishments etc. ), attractions, sports and transportation. Multiple items can be selected from a scrolling list of information and viewed in layers on the map. Navigation features includes service routes of buses, bus arrival timings and fares to facilitate public commute and detailed stepwise directions. TrafficQuery would provide a view of live traffic conditions, traffic cameras and traffic incidents. OneMap is a multi-agency collaboration with over 60 government agencies currently participating and contributing information. More agencies will be coming on-board soon. The app has been built by SLA’s geospatial engineers based on open source technology as part of geospatial capacity building. It can be used by the private sector and the community to create useful and value-added services. Campaign for co-develpment of solutions – OneMap IdeaWorks! To foster co-development of geospatial solutions and analytics through the use of the new OneMap and open geospatial data, SLA also announced the launch of a three-month campaign called “OneMap IdeaWorks!”. It will bring together technologists, data scientists and community organisations to tackle challenges from the areas of Community, social services, environment, health, transport and heritage. Till date, 60 challenge statements have been gathered from 19 community and public agency partners. Several community organisations, such as Kwong Wai Shiu Hospital and Singapore National Stroke Association, have contributed challenge statements and hope to get ideas and solutions. For instance, SG Enable, an agency dedicated to enabling persons with disabilities, hopes to see information on accessibility being readily provided to persons with disabilities and their caregivers, helping them to overcome challenges in navigation and route planning. Seven technology and content partners have pledged their support for OneMap IdeaWorks! Start-up groups and tertiary institutions such as NUS Enterprise, Nanyang Polytechnic and SMU Living Analytics Research Centre (LARC) have pledged their support to gather their students, technologists and data scientists to participate in the development of apps, solutions and analytics. OneMap IdeaWorks! partners will use the new OneMap Application Programming Interface (API) services, some 300 sets of open geospatial data and data provided by the content partners, and data from their own sources to develop solutions in the form of mobile, web or analytics applications. The evaluation criteria include originality (30%), social impact (40%) and sustainability (30%). OneMap IdeaWorks! has two main tracks – the Open Category is open to the public, technologists and data scientists of all ages. The School Category is open to students ranging from secondary up to undergraduate levels. Prizes totaling more than SG$10,000 will be awarded to the winning teams. The campaign will conclude on October 12, 2017 with a showcase of apps, solutions and analytics. Read the press release on the launch of OneMap IdeaWorks! here/ Access factsheet on OneMap IdeaWorks! and the new OneMap here.